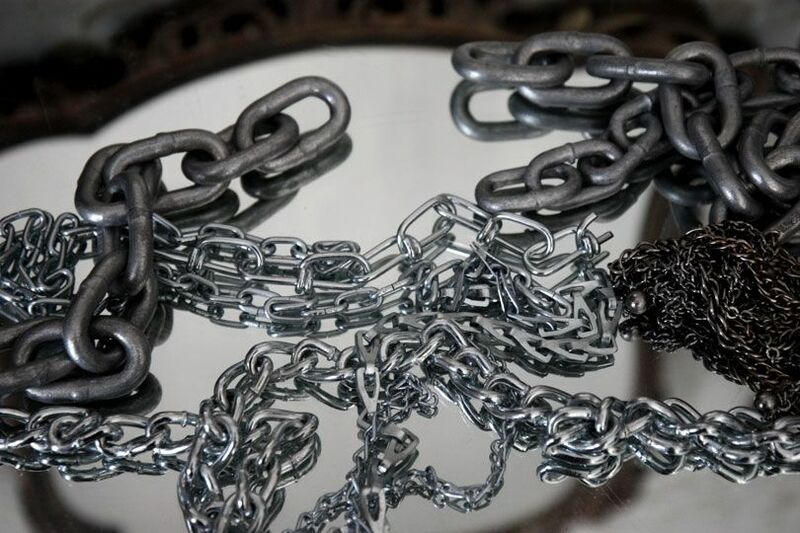 This weekend I set out to make what I've been craving, but have, as of yet, to find: chain harnesses. I wanted these to be totally adjustable, and interchangeable. I wanted them to fit over a boot or a sandal, to intensify and seriously dramatize even the most pedestrian of shoes. 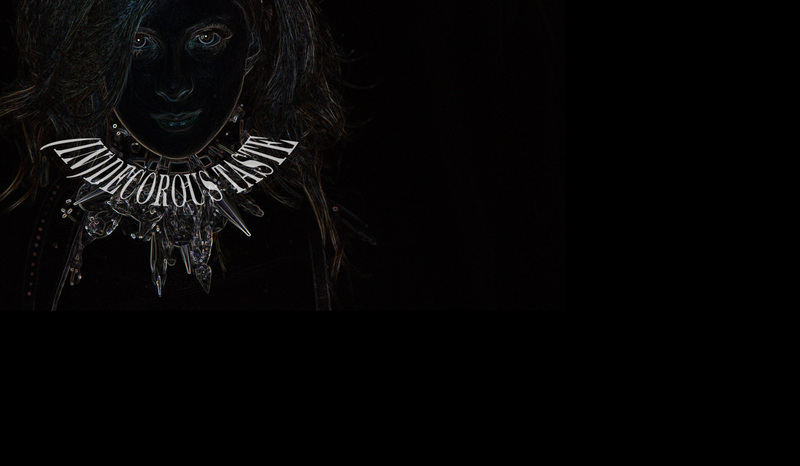 They became a sort of exercise in scale and texture... a combination of huge industrial chains, necklace chains and steely vintage paste rhinestones. And, though I'm wearing them with the clear wedges in these photos, they could be worn with heels, or wedge booties, even. Perhaps I'll take some pictures later this week, when I wear them out. YES, of course I'm going to wear them! And they do weigh a ton. But, this degree of intensity can only come at price. And if all else fails, one can think of it as...exercise? Some women run around the track with weights strapped to their ankles, but where's the fun in that?! Styled and photographed by (IN)DECOROUS TASTE. you are so inspirational i want to punch myself in the face for not being as awesome as you. i sound really creepy, woops. but seriously i have been lurking this blog going through your archives the entire day, you are awesome! You're legs are going to be in amazing shape from these babies! Love the combination of various chains and rhinestones. those shackles are badass. i love how they mix tough and girly. You have got to get the pictures, Hope the streets are clearing of snow for you- can not quite see them with wellies. Amazing... I need some of these chains!! 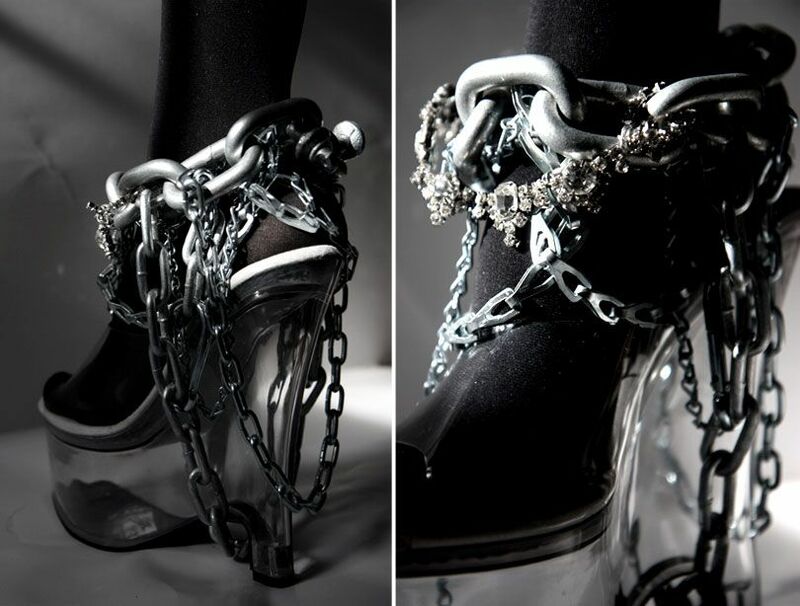 This is seriously awesome and I've been obsessing over assorted "shoe jewelry"/chains/leather straps/harnesses etc for a while -- I really do hope you wear these out and ALL THE TIME. 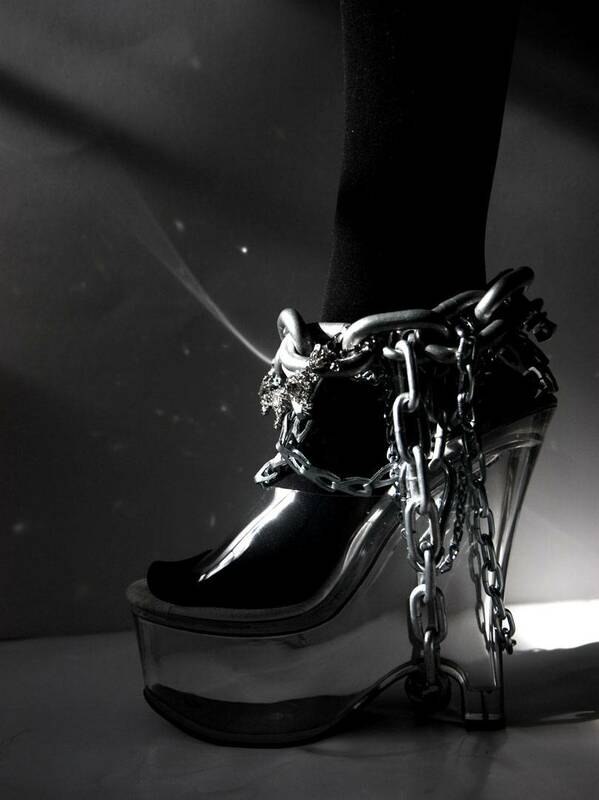 You've seen the shoe-wings that Zana Bayne makes already, yes? http://www.garbagedress.com/2009/12/oh-hello.html Super cool as well. That looks hot! Would make any biker go grooling over them. I can only admire (and I really do mean admire!!!) your nerves of steel and fearless attitude...especially since (from my world) I would simply sink in the snow! Interesting comment smilla.I was thinking perhaps Lauren had inadvertently invented snow chains for heels! I had a friend who always wore heels in snow and claimed her high heels made perfect ice picks! I, like you, appreciate the trail blazing Lauren is doing. Total Power! I don't know what Marley's Ghost would say, but if you asked me, eternity in chains never looked so appealing. (In)decorous Taste is a sorceress of shoes, conjuring up cool kicks for all occassions. Can't wait to see what shape these black magic heels morph into next. I'm not sure how I came across here, but the sheer thought that a)you came up with this foot contraption and b)styled and photographed it is throwing me into amazement. This is really avant garde, totally grotesque and completely inspiring. I can't synthesize what I'm diving from these images yet, but there's a lot here to entertain the eyes and soul. Ok, I should have just said speechless. wholly wow! your shoe styling photos (well any of your styling photos really) are so phenomenal. Oh wow! Probably a workout too!! Wow these are amazing! Wish I was that talented! IM WORSHIPPING U RIGHT NOW! !